Asia Provocateur: EXCLUSIVE INTERVIEW: Thai Pro-Democracy Leader Jatuporn Prompan on BBC Claims of a Red Shirt "Armed Wing"
EXCLUSIVE INTERVIEW: Thai Pro-Democracy Leader Jatuporn Prompan on BBC Claims of a Red Shirt "Armed Wing"
There are numerous claims - particularly from the BBC - that armed elements of the Thai pro-democracy Red Shirt movement have been staging violent attacks against the Thai fascist protests and rallies. So far these allegations remain only as claims and when pressed on what evidence exists the BBC have offered no primary evidence or source. In fact the BBC's Bangkok correspondent, Jonathan Head, has changed from claiming that third parties close to the armed wing told him who carried out the violence to claiming he has personally met those engaged in the violence. Which is it? He seems very confused. Yet, despite this very slippery & dubious tertiary and secondary evidence the BBC's correspondent has gone on to make further claims that "several thousand" armed Red Shirts now exist in a "cell structure." Of course to operate such an armed cell structure with an explicit political agenda requires discipline, extensive training, a chain of command and 1000s of weapons and tons of ammunition. The BBC's correspondent has yet to provide one single scintilla of evidence of any of that existing apart from a "source" he has spoken to. So, I challenge Jonathan Head to put up or shut up. It should also be noted that Mr Head has yet to provide a space to a single Red Shirt voice to challenge his claims - a clear breach of the BBC's rules on impartiality. To give some balance to the debate I interviewed the leader of Thailand's pro-democracy UDD/Red Shirt movement, Jatuporn Prompan and asked him about the BBC's claims. The BBC have stated as fact that an armed cell of the Red Shirts fired the M79 at Ratchaprasong that killed the children - do you have any thoughts on that? "There is no evidence showing that the Red Shirts carried out this action. There is no point for the Red Shirts to attack civilians and now the case is being investigated by the police. The Red Shirts uphold peaceful means and to carry out such an attack would undermine the mass support we receive. It would also destroy ourselves [our movement]. Therefore I can confirm that none of the Red Shirts will carry out such an attack as it doesn’t benefit the movement. It’s up to the police to find out who carried out this attack." Another claim from the BBC is that there are "1000s" of organised "armed cells" of Red Shirts - which would make for a very, large, well-organised armed wing - how would you respond to that? "I can confirm that this is not true. If we have that kind of armed wing with the numbers that the journalists claim then it must be very obvious and easy to see. If there are one to two thousand armed people then there must be some evidence of them being trained. They must also “exist” in evidence - you cannot just say they are there. This is just like 2010 when there was an allegation that 500 Red Shirts were armed. So we responded to the allegation then that there was a lot of foreign and Thai media at Phan Fa and at Ratchaprasong, with no restricted areas. If there was an armed element then where were the pictures? But the fact was that there was no armed element. The story about an armed element existing was issued by the Red Shirt’s enemies in order to justify the killings of the Red Shirts." Whilst the army seem unable to act right now - at least in the open - are their threats real? "The coup in Thailand could happen at any time. No one can confirm when will the ‘last time’ [a coup will be staged]. Thailand’s democracy is so fragile that the overthrow of it could happen at any time. No-one can guarantee when these coups will end. So, at the moment, I believe the PDRC [fascist] movement are trying to create a situation which will lead to a coup d’etat. This is the key goal of the PDRC because they cannot change anything by using other means. Their only option is a coup d’etat." 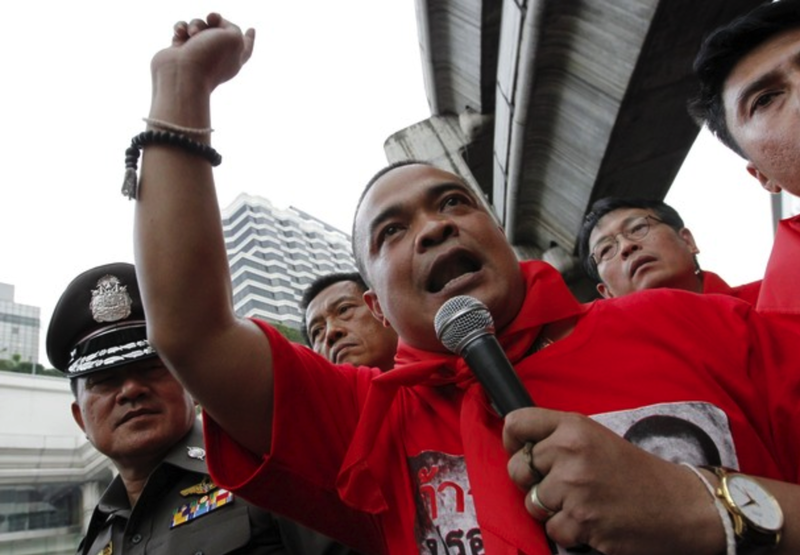 How can the Red Shirts and the UDD help secure Thailand's democracy? "By utilising the struggle of the vast majority of Thailand. They [the Red Shirts] represent the majority. The declaration of democracy will benefit all Thai citizens despite the differences in opinion and, eventually, the Red Shirts’ struggle will lead to change and will bring true democracy by the people. This is the goal of our struggle." I blame Jonathan Head for the Coup! Actually, you're wrong. It was Jonny Cat.